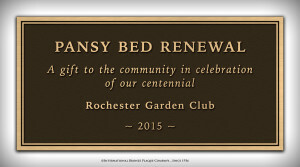 The bronze plaque commissioned by the Monroe County Department of Parks honoring Rochester Garden Club in thanks for our gift of $100,000 to underwrite the Pansy Bed Renewal in Highland Park. Throngs visited Highland Park to view the lilacs. Thanks to Rochester Garden Club, the ever popular Pansy Bed, boasting 10,000 plants, has been exquisitely renewed for all to enjoy. In honor of its 100th Anniversary, the garden club has granted the $100,000 necessary to revamp the iconic landmark that was crumbling and in disrepair. There was a dedication and ribbon cutting at the Pansy Bed on Monday, May 4 at 9:30 a.m. Representatives from institutions and organizations involved in the renewal attended. The public was invited. The $100,000 grant covered the cost of creating an ADA compliant design and the creation of a barrier free landmark that features eight foot wide bluestone walkways, limestone seat walls with bluestone caps, additional benches and an improved irrigation system. At the center of this dazzling stone hard scape is a large bed planted out in colorful pansies each spring. There is a bright new design each year. After the pansies finish blooming they are replaced colorful annual flowers for the balance of the growing season. Rochester Garden Club was founded in 1915. It’s very first project was creating the Poet’s Garden, also in Highland Park. Funds for this Centennial grant were raised over the past decade with proceeds from the club’s Annual Geranium Sale. There are 120 members in Rochester Garden Club, which is both a Federated and Garden Club of America club. “From Susan B. Anthony House to Ronald McDonald House to Hillside Children’s Center to the El Camino Trail Project, Rochester Garden Club has been committed to the beautification of our city for 100 years.” notes club president Suzanne Spencer. Highland Park started with a 1888 land donation made by successful nurserymen Patrick Barry and George Ellwanger. The park was designed by Frederick Law Olmsted. Olmsted’s vision was that the park be a “restful and restorative public space”. 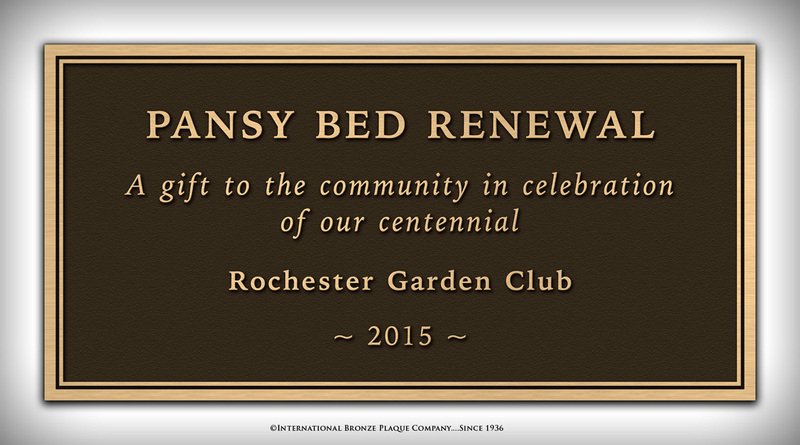 Rochester Garden Clubs Centennial Project Chair, Barbara O’Hare, points out “The renewed Pansy Bed commemorates that vision and Rochester Garden Club is proud to have made this community project possible. View the Pansy Bed Renewal Photos. A member of The Garden Club of America since 1925.